Irish Times journalist, Ian O’Riordan has been reporting on sport since 1998 with one of his first breaks in journalism coming with his coverage of the 1998 Tour De France in Ireland. He has cycled every square metre of Wicklow in a lifelong love affair with Ireland’s Garden County. 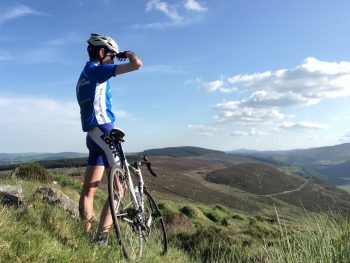 The former US scholarship athlete uses his bike for fitness more than ever and has produced a new guide to the best rides and routes in the, Cycling in South Dublin and Wicklow: Great Road Routes. What inspired you to produce this guide to bike riding in Wicklow? being born at the foothills of the Dublin Mountains is that they enter your subconscious at an early age and never let go. From an early age they also became my playground of sorts, thanks chiefly and fortunately to devoted grandparents who took us mostly willingly on Sunday walks up and around places like the Sugar Loaf, Djouce Mountain, and the Hell Fire Club. At school in De La Salle Churchtown I sat in many a classroom that looked directly out at the Dublin Mountains, and can remember becoming increasingly lured by a longing to escape into them, either by foot or any other means.When I started running as a teenager this opened up another avenue, as most Sunday mornings we would set off from Marlay Park and run up through Cruagh Wood and back, or sometimes all the way through Glencullen, where after many years abroad and in the city I returned to live. It was by bicycle, however, that the Dublin Mountains truly revealed themselves in all their openness and glory, and by natural extension, the Wicklow Mountains, the largest continuous upland region in Ireland. When long distance runs in the mountains became a little more of a chore than a pleasure the bicycle at first proved a worthy substitute and now, I think, a superior one. The distances are far more manageable and far less limited, and there is something uniquely intimate about cycling on mountainous or hilly roads, certainly a step closer to Mother Nature and all her seasonal personalities. After 12 years of cycling and discovering new routes, and encouraged by the good people at The Collins Press, this cycling guide emerged from the notes and maps and memories. Can you remember your first bike ride in Wicklow? Indeed, it was with my older brother Donal, sometime in the summer of 1986. He was 17, I was 15, and we drew a rough map of how to get to Glendalough, then rode over the Wicklow Gap to Laragh, and after a brief stop off in Glendalough, rode back through Roundwood and Enniskerry to the family home in Churchtown. It took us an entire day and the memory will last a lifetime. What was your most memorable day riding your bike in Wicklow? Hard to single one out, although as recalled in Route 5, the Glencullen-Laragh Circuit, one day in early June, a few years ago, having turned left at the Sally Gap and riding up towards Luggala, another cyclist suddenly appeared on the road ahead of me, tearing up the steep incline with a hardy look of determination – a sort of cross between Bill The Butcher from Gangs of New York and Daniel Plainview from There Will Be Blood. He passed me in a speedy blur but a couple of minutes later I was thinking the resemblance had been a little too uncanny; later, when riding back up from Laragh, I passed him again, this time realising it was indeed Daniel Day-Lewis. It was about a year since he’d won his second Oscar for his role as Daniel Plainview, and riding in the Wicklow Mountains like this was his way of retreating from all the trappings which usually come with a success like that. I flagged him down to say hello and we ended up sharing the few miles back through Laragh, and he was thoroughly enjoyable company, recalling how cycling had always been his thing, especially in the early days in London, where he would ride around to various auditions, often showing up with splashes of bicycle oil on his hands and face. Although by then into his 50s he also looked superbly fit, which of course anyone would if they cycled regularly through the heart of the Wicklow Mountains. You’ve seen the route of the Wicklow 200. What advice would you have for first time entrants or people thinking of taking the plunge? The best way to take on any long cycle such as the Wicklow 200 is to embrace it, pain and beauty and all. I often think about and quite one of the original and still best cycling books, The Rider, by Tim Krabbé, which like On the Road and The Great Gatsby, is best read in a slow and continuous loop. To the last word it’s the perfect paean to all the pain and pleasure and the fellowship of the road bike. From the opening paragraph, where Krabbé looks at the non-riders around him – “the emptiness of those lives shocks me” – it is by turns of the page subjectively arrogant and despairingly real. It was written in 1978 and reads even louder today. Just some things to consider, whether in the rain or shine, while ascending the Wicklow Gap, and racing down into Glenmalure. Do you have a favourite of any of the rides you’ve detailed in your guide? Probably Route 4, Sally Gap-Luggala Loop, as it passes right over the Luggala Estate; On the last day of January 2012, I packed several boxes into the back of my Jeep Wrangler, drove the 25-odd miles into the Wicklow Mountains and across the Sally Gap, then checked into a small cut stone cottage in the heart of the 5,000 acres of outer remoteness that is the Luggala estate. It was a nuclear cold winter’s morning. My family reckoned I’d survive no more than a month, my friends said no more than a week. Instead I survived more than a year, each day dreaming I had woken up in another world or another lifetime or somewhere in between. Obviously your first love is athletics so what is it about cycling that really appeals to you? Again, it’s the extra distance that the bicycle allows you to travel, while also taking in more of the surroundings. And dare I say the older and the wiser I become, getting out on the bike is a lot easier than getting out for a run, and you don’t have to lie down for the rest of the day. 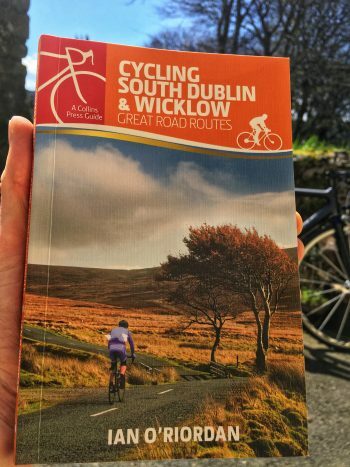 Cycling South Dublin and Wicklow: Great Road Routes is available through Collins Press. Entrants to the Wicklow 200 will also be in with a chance to win a signed copy.